Inventors don’t always make the best entrepreneurs. The skills and attitudes needed to develop new ideas are not the same as those required to turn new ideas into self-sustaining, commercially successful enterprises. However, one young Canadian is set on combining the two skill sets to make her mark on the world. Ann Makosinski’s invention, the award-winning Hollow Flashlight uses body heat to provide light. She came up with the idea as a teenager after discovering that a friend in the Philippines was failing in school because she didn’t have any electricity or light to study at home during the night. The Hollow Flashlight converts excess body heat into electricity to power an LED bulb without the need for batteries, solar, or kinetic energy. The gadget uses Peltier tiles, which produce electricity when one side of the tiles is heated, and the other cooled. By heating one side of the tiles with the palm of one’s hand, and cooling the other side with a hollow aluminium tube, energy is produced. Ms Makosinski devised the gizmo and then added a transformer and a circuit so that it can supply five volts of alternating current. The flashlights work on a temperature differential basis, therefore the colder it is outside, the brighter the light will be. However, even in warmer environments the hollowed flashlight can sustain a strong beam of light for more than twenty minutes. Ms Makosinski made her prototype in her basement at home in British Columbia. The materials employed cost $26. Ms Makosinski has filed a patent for the Hollow Flashlight and is collaborating with professionals to increase the device’s brightness and further improve its efficiency. Another of her inventions is the eDrink, a phone-charging travel mug that harvests the excess heat of your hot drink while you’re waiting for it to cool down and converts it into electricity for your mobile device. This December her inventions won her a £24,000 grant from Shell Canada and Canadian Geographic. Her inventions have led to global recognition. 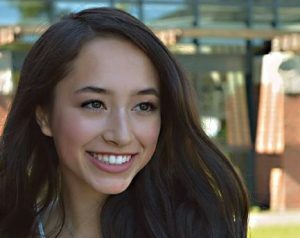 Ms Makosinski was named one of Time Magazine’s Thirty Under Thirty: World Changers in 2013 and also won the 2013 Google Science Fair for her age group. She was invited to talk at TedxTeen in London in January 2016, and is a Global Ambassador for The AAT Project. She is also a global ambassador for Uniqlo’s Heattech fleece product line that takes body heat and stores it within the fibre to keep the wearer warm. It harvests thermal energy in the same way as the Hollow Flashlight, enabling garments as thin as 0.55mm to heat the wearer. Ms Makosinski says she has always had an interest in both talking and tinkering and enjoys fixing problems she identifies around her. As a kid she did not have a phone, game console, or other tech gadget but found plenty ways of inventing her own. While she credits this as a factor in fostering an interest in technology, she admits it made her someone who didn’t fit in all the time with other teenagers. The impressive Ms Makosinki clearly has an inquisitive mind and a keen sense for problem-solving. She will now apply that beautiful mind to running a business, working on new inventions, writing books and developing a TV show.